There are a few different ways to ensure that your back remains healthy for the longest possible time. Of course, good posture is one of the best-proven ways to keep your back in good shape, but there are a few other options that can help with more immediate concerns like back pain and spasms. Today, we are going to be reviewing a product that can help with back pain to an immense extent. We will take a look at the BraceUP ﻿lower back brace, which is designed to provide a massive amount of lumbar support to aid users who have issues with lower back pain, chronic or otherwise. You may be wondering what exactly you should look for in some of the best back braces on the market, and there are a few different valid answers. For example, you will want your back brace to be relatively light, as that will help improve it in several ways. A lighter back brace will be more suitable for extended use, and quite a bit more. The lighter your brace, the less tired you will get as you wear it longer, but back braces which are less heavy also tend to be slimmer. If you are wearing a thinner back brace, it will be less likely to be visible beneath your clothing, so it will not disrupt the fit or look of your clothing to the same extent. Regardless of your reason for wearing your back brace, you typically don’t want it to ruin the fit of your favorite clothes. The best back braces won’t look or even feel like they are there, so you can go about life as if you aren’t even wearing them in the first place. Now that we have gone through some of the fundamentals to search for in back braces, we can move on to our review of the BraceUP lumbar support brace. 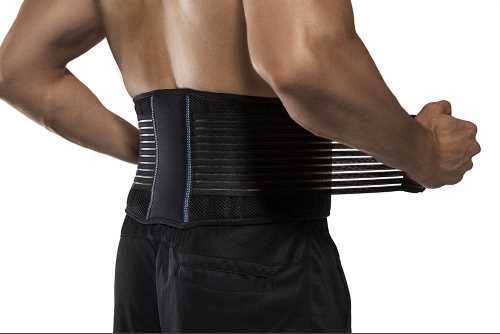 What exactly makes the BraceUP lower back support brace so much better than similar products? There are a few features that make this product better suited for use by customers who prefer an affordable back brace that will not sacrifice comfort or support to achieve that more reasonable price. Unlike many other braces that provide a high level of support, this product does not obstruct your movement in any way, making it an ideal choice for users who would like to remain active. If you have tried other back braces and they feel like they constrict you, this model may be a better option. A typical issue with back braces is that it can be difficult to adjust the fit to a precise level, and that problem is mostly rectified in this product. You can improve the fit of this back brace by using the dual fit adjustment straps that are located along the brace; these straps also provide compression. An advantage of this back support brace is that it can be found in a range of different sizes so many different customers can find one that fits them perfectly. There are three different sizes available for this back brace, S/M, L/XL, and XXL. All of these different sizes still feature an adjustable compression fit. The S/M size of this back brace can fit waists from 28 - 35 inches, L/XL can fit those with a size of 35-43 inches, and the XXL can fit those with a belly that is 43 - 53 inches. As you can see, there is a wide range of sizes that you can choose from should you decide that this is the ideal model for your needs. The panels that sit up against your abdomen are made out of mesh, so you don't have to deal with the typical back brace issue of overheating during hotter days. You can wear this brace on the most sweltering summer days, and you won't even have to worry about sweating in it. This back brace is also explicitly designed to reduce the likelihood of issues like bunching and slipping. If you need a brace that is convenient and comfortable, you can't go wrong with this product. Thanks to the simple adjustment method and the variety of sizes, you can always be sure that this brace fits perfectly. If there is one aspect that we have to say characterizes this back brace, we would say that it is user-friendliness. This model is ideal for new back brace users as well as those with reduced mobility. In this part of our review, we are going to go over what others had to say about this product. Customers left quite a few testimonials about this back brace, and some of them were positive while others were negative, we will give a variety of examples to give you a better idea of the product. Many customers chimed in to let others know that this back brace provides enough support to keep you upright and your back from being affected by sprains or other issues. Others praised the liberal use of mesh in the design of this back brace, making it ideal for use in hotter conditions. There were a few negative reviews, but most of them were about braces that did not fit properly, which is to be expected when such products are purchased online. This is one of the more affordable back brace models that you will find that provides this level of lumbar support. The S/M and the L/XL size can be found for around 24 dollars, while the XXL model is only 2 dollars more. In any case, this back brace is exceedingly affordable for most. We hope that you have been able to find out whether or not this is the best lower back brace for your needs over the course of our review. Feel free to leave a comment down below to let us know what you think of the review or this product.